The Diambars Academy had a sensational first season in the Senegalese 2011-2012 Ligue 1, finishing the season as runner-up. 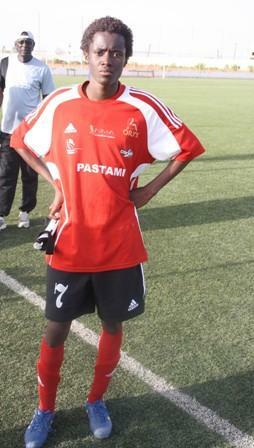 One of the key players at Diambars is talented right-winger Arfang Boubacar Daffé, born 13.12.1990. My first record of Daffé is from the 2009 Ligue 2, the second level of Senegalese football. At the time, Daffé was 18 years old. In 2010, Daffé was an important member of the Senegal U-20 national football team, playing important qualifying matches for the 2011 African Youth Championship in South Africa. Unfortunately, Senegal U-20 failed to qualify for the tournament. Daffé was still playing second level football for the Diambars Academy during the 2010 Ligue 2 and at the start of the 2010-2011 Ligue 2. In January 2011, a few weeks into the new season, Daffé joined Atlético Madrid B, the reserve team of Atlético Madrid in Spain. According to SoccerAssociation.com, Daffé played one match during the Segunda División B 2010-2011, the third level of the Spanish football league system. As far as I know, the contract with Atlético Madrid B was a loan contract and Daffé returned to Senegal after approximately six months. After his return, the Diambars Academy became champions of the 2010-2011 Ligue 2, gaining promotion to the top division of Senegalese football. As far as I know, Daffé has missed only one of the 20 matches played by the Diambars Academy during the Ligue 1 2011-2012. According to most sources, Daffé scored one goal, against Guédiawaye FC on 18.01.2012, although FootballDatabase.eu writes that he also scored a goal against ASC Niary Tally on 26.08.2012. Daffé, apparently 178 centimeters, is an excellent dribbler. He is also known for his pace and accurate crosses. Speedy wingers Daffé (right) and Souleymane Cissé (left) has proven to be essential for the attacking play of the Diambars Academy. Although primarily a right-winger, Daffé is also comfortable as a striker. Daffé’s first stint in Europe was not memorable but after a successful season in the tough Senegalese league, I think he is ready for a new adventure in a bigger league. The picture of Daffé was found on http://cesti-info.net/.